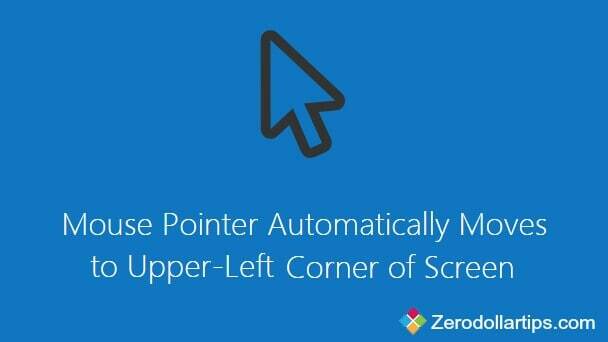 Why Mouse Pointer Automatically Moves to Upper-Left Corner of Screen in Windows 8.1? Why my computer mouse cursor keeps leaping to the top of the screen? Or, How can i fix the problem of mouse pointer automatically move to upper top corner of the screen? etc. After getting several queries like these, i decided to share some super quick ways to fix the mouse pointer problems. In result, i came up with three effective methods to fix the issue of mouse pointer moves on its own. Usually, this kind of mouse pointer problem is faced by the Windows users who use touch-based Windows laptop or desktop computers. If you are using Windows 8.1 laptop or desktop then sometimes you might encounter that mouse pointer automatically moves to upper-left corner of screen. Even, sometimes it clicks at the top corner without any touch. Step (1): First of all, open Control Panel and select “Hardware and sound” option. Step (2): Under the Hardware and sound section, you will see “Tablet PC settings” option. Step (3): Open the Tablet PC settings and click on “Calibration the screen for pen or touch input”. Step (4): Next, click on Calibrate… button to proceed. Step (5): Once the calibration is done successfully, your problem “mouse pointer automatically moves to upper-left corner of screen in Windows 8.1” will be solved. In case, this method doesn’t help you to fix the mouse pointer problem then try out the second method which has explained below. Step (1): Firstly, open Control Panel and then click on Mouse option. Step (2): On Mouse Properties dialog-box, go to Pointer Options tab. Step (3): Under the Snap To section, select “Automatically move pointer to the default button in a dialog box“. Step (4): Now, click on apply button. That’s it! This method should fix your mouse pointer problem. If not, try out the third method which has given below. Thus, you can easily fix your mouse pointer problems by applying these above explained methods. Do you know any other ways to fix: mouse pointer automatically moves to upper-left corner of screen in Windows 8.1? Thank you1 I was losing my mind and your tips fixed my problem. It’s annoying stuff like this that ended up making me roll back to Windows 7! No regrets, either – W7 is awesome. Thanks for this help. I have no idea why this began happening as I’d not made any changes but after dealing with the irritation just a few hours, I found this and it worked. I disabled my touch screen in my windows 10 and that solve the mouse pointer moving on its own. > Mice and other pointing devices > USB Touchscreen Controller). I found that with the USB Touchscreen Controller enabled, the mouse pointer would flicker erratically whenever the lid was moved back and forth, so there must be a loose connection or exposed wire in the lid’s hinge.